Telephones have come a long way since the days of Alex G. Bell. Although a typical land line telephone still operates essentially the way it has been for the last 100 years, the capabilities of professional phone systems is where the true advancement has taken place. Whether you need a simple 6-room residential system or a complex 100+ station office system, Press Play has the knowledge and experience to meet your needs. 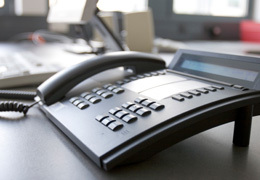 Phone systems offer many great features including multiple lines and extensions, individual voicemail boxes, custom programming, intercom, and much more. Also, certain phone systems with an automation controller built-in can be used to control lighting, shades, thermostats, music, TVs, garage doors, alarm and security cameras.